Infertility treatment is currently available in several centers in the garden city (Bangalore) and few centers all over state. However, we pride ourselves in providing our patients with the utmost personal care and attention. We have implemented our personal philosophy in that couples deserve the best clinical care, and importantly, the most compassionate care available. Couple will get the most state-of-the art facility, including our Embryology, Andrology Endocrinology and Endoscopic surgeries. The couples will immediately realize they are dealing with a center like no other. 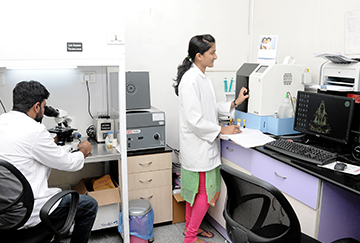 This combination has resulted in CAREE having the HIGHEST quality control and assurance Which is must in order to get better IVF success. The entire staff at the CAREE is looking forward to help you achieve your dream. Your comments are critical in making us better. You are never treated as a number. Our couples are all-unique, and are treated as such. Our patients are hand-held throughout their evaluation and treatment, which will result in faster success. You are being taken care by a single Doctor who knows everything about your specific case, and does your ultrasound, surgery insemination, egg retrieval, and embryo transfer. Our patients practically never wait for their appointment, again unlike most other practices. Our patients are seen always on time. We respect and value your time; our location is extremely convenient, even for patients coming from outside the city or other cities in the country. We are offering our various advanced technologies such as IMSI, blastocyst culture, and time-lapse video to select better quality embryos. Embryo and oocyte freezing. The Vision of the caree fertility is to be the nationally and internationally recognized leader for multidisciplinary information, education, advocacy and standards in the field of reproductive medicine. The caree fertility is an organization whose members must demonstrate the high ethical principles of the medical profession, evince an interest in infertility, reproductive medicine and biology, and adhere to the objectives of the Society.